Welcome back by, sweet blog friends! I hope you're all enjoying your creative time this week as much as I have been. I'm also hoping to "get my craft on" next week as well when I spend some more time with my best friend. We were able to visit our favorite scrapbook store this morning and got some new goodies and gained some fabulous inspiration. I'm excited to share this card with you. This one was made using a sweet stamp set and coordinating die set from Lawn Fawn. It's called Some Bunny Stamp Set and the coordinating dies are called Some Bunny Lawn Cuts. They are adorable, as you can clearly see. Don't you just LOVE the pink and grey color combination? Thanks so much for stopping by to visit me today, dear blog friends. I am so grateful to have you say hello and take a wee peek at my card. Hope your day turns out to be fabulous! This bunny looks like he's ready to hop right off the card, doesn't he? Thanks once again for visiting me today, friends! 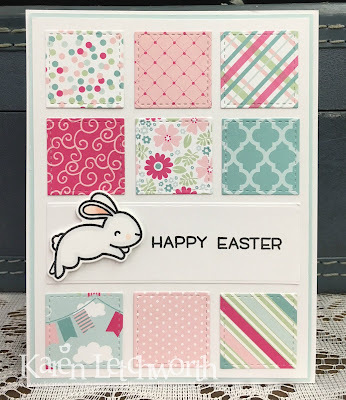 Here's the link to the Lawn Fawn Challenge where I'd like to share my card. 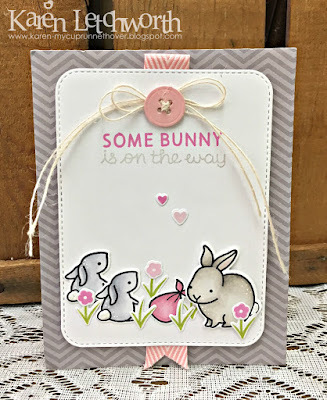 Lawn Fawnatics Challenge Blog - Challenge #24 - Fun With Dies - I used the Some Bunny Stamp Set and the coordinating Some Bunny Lawn Cuts to create all the sweet bunnies and accents. Pile It On Challenge Blog - Challenge #140 - Circles And/Or Squares - So...I'm entering my second card (above) at the bottom of the page. 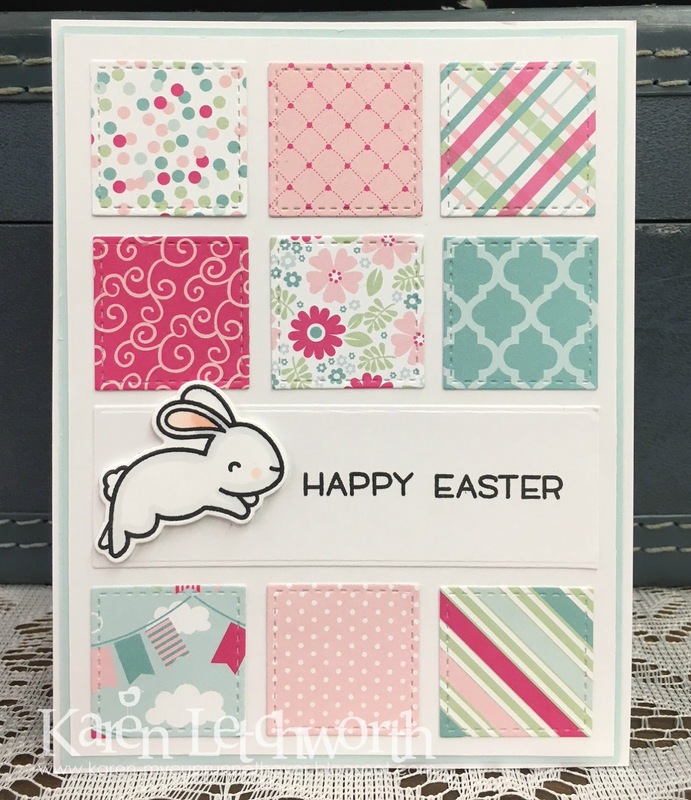 It has a total of NINE little SQUARES cut from various patterned papers that are each machine stitched, and the the card is stamped with a bunny and image from a Lawn Fawn stamp set. Dragonfly Journeys - Challenge #114 - Bunnies, Chicks and Ducks, Oh My! 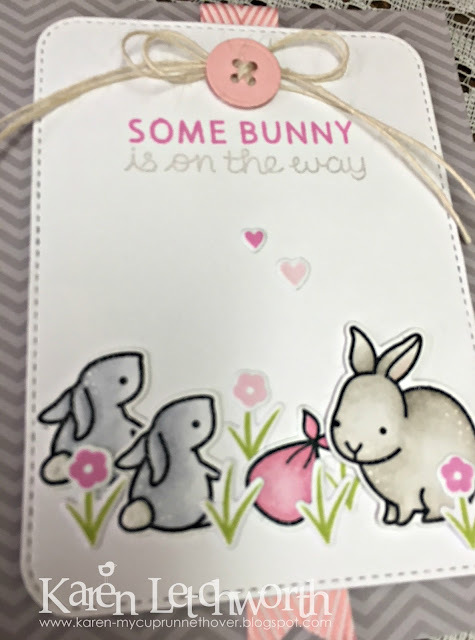 I used several sweet little bunnies on these two cards, and lots of other sweet Easter peeps on my other recent posts. Oh, such fabulous design! !Love that cute bunny and the papers you choose for the array of squares! Love this charming grid design! The mix of papers is so beautiful! 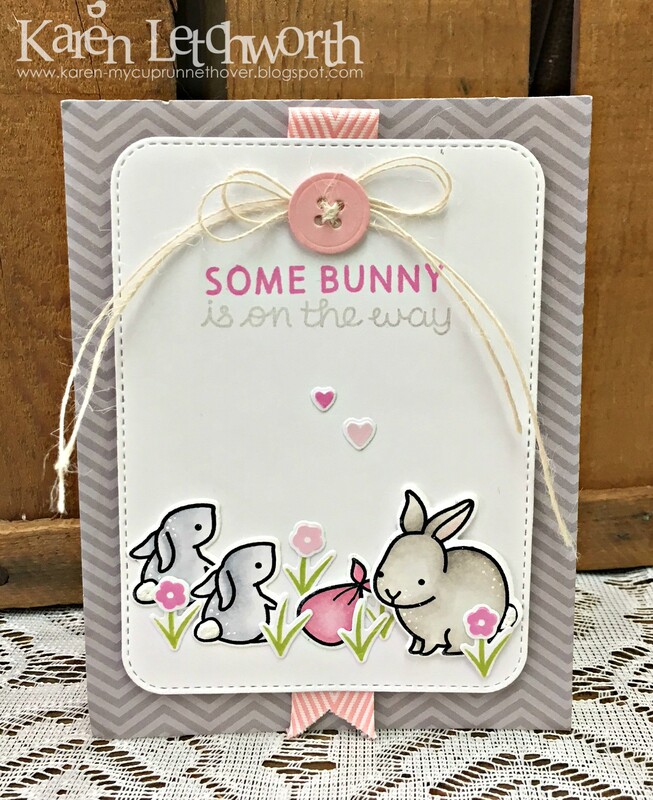 Thanks so much for joining the Fun with Dies challenge at Lawn Fawnatics! Love these cards - the stitching on those little squares is perfect!